Latch Hinges combine a latch & a hinge in a standard piece of hardware. Latch Hinges may include a spring release and could have either a pair of spring-loaded handles or a single handle, which pulls toward the center to release the body from the application. An alternate style relies on an engagement hole or slot in the adjoining surface. Installation is simple and inexpensive using screws, rivets or by welding. 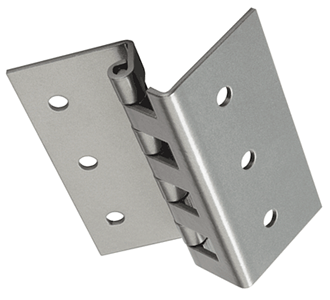 All styles of Latch Hinges are manufactured to close tolerances. End play and side play are held to a minimum, insuring a precision fit and smooth operation. Monroe Hinge & Stamping Company is ready to work with you on developing the right latch hinge for your application. All of our latch hinge projects start with a question, a print or a sketch. We are ready to provide you with the support your need to complete the design and manufacturing and delivery of hinges for your project. Are you looking for Latch Hinges?